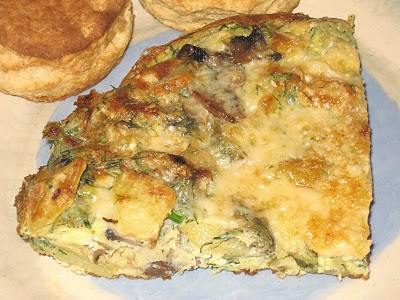 As the summer produce has waned I have not been making many frittatas, but I wanted to share this one as it was a particularly good frittata, with just a few simple ingredients: eggs, potato, onions, garlic, fennel and cheese. The secret? Adding a scant half teaspoon of fennel seeds to the oil just before adding the potatoes. The more I use those little devils the more I like them, and they seem especially appropriate to use with fennel; although they do not taste the same, they have the same hint of anise and complement each other beautifully. Fennel seeds are also good with braised meats and vegetables. I will often throw them into the hot oil just before adding the aromatics or searing the meat. Their distinct flavor is not something I want all of the time, though, so I only use them when I am looking for that slightly nutty, licorice undertone to a dish. Everything else about this frittata is the same as the many others that I have made. After adding the seeds to the oil and letting them simmer for a minute or so I add the sliced potato and let them have a chance to brown for a few minutes before adding the onion, garlic, and sliced fennel. When the vegetables are cooked through I add the egg mixture and let it set, sprinkle about a fourth of a cup of grated parmesan over the top, and put it in the broiler for a couple of minutes for the top to set and the cheese to brown. Pure deliciousness. For the recipe, go here. For the basic technique, go here. For a lotta frittata, go here.